A new study released by J.D. Power has revealed that Canadian banks need to step up their game when it comes to providing banking advice to customers over digital channels. The 2019 J.D. Power Canada Retail Banking Advice Study, released last Friday, shows that nearly 60 per cent of customers surveyed said they want to receive financial advice from their banks through a website or mobile app and using things like online interactive tools, articles and videos to do so. Disappointingly, only 10 per cent said that they had gotten their banking advice this way. “There is clear demand for financial advice among Canadian bank retail customers, and when banks get the formula right, that advice drives significant customer loyalty and advocacy, but many banks are still missing the mark,” said J.D. Power’s Senior Director of the Banking Practice, Paul McAdam. “Increasingly, all signs are pointing to digital advice offerings as the channel where retail banks can drive the most significant improvement. And the market is primed for a shift in this area of banking service, with the J.D. Power study revealing that 85 per cent of Canadian banking customers are interested in receiving financial advice from their institution, with 72 per cent of those who took advice actually acting on it. With an increasing base of customers under the age of 40, there’s a huge opportunity here for banks to tap into the needs of its younger customer base, whose overall satisfaction with advice offered by their banks, according to the study, has declined since last year. Topping the list of most common types of financial advice customers are looking for include investment-related advice, quick tips to help improve their financial situation, retirement advice, and spending and household budget advice. But which of Canada’s top banks are customers most satisfied with when to comes to financial advice? According to J.D. 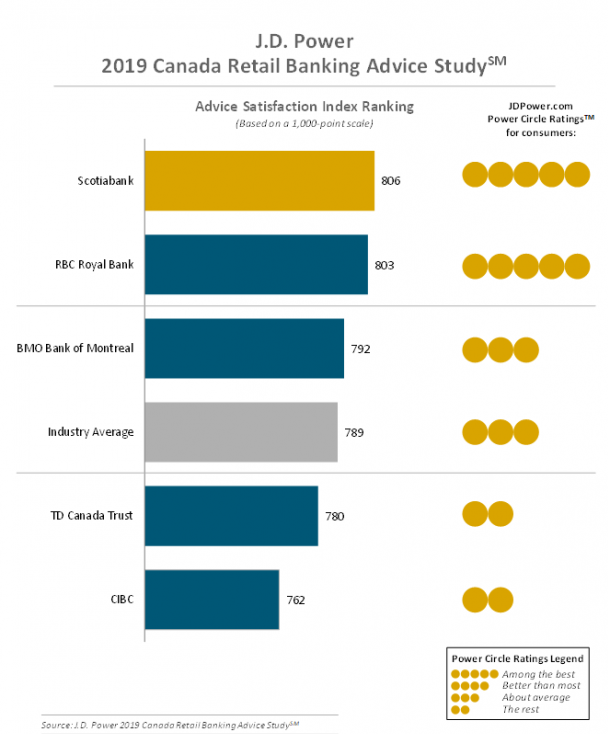 Power, Scotiabank ranks highest in customer satisfaction with retail banking advice with a score of 806 (out of 1,000), compared to RBC Royal Bank at 803 and BMO Bank of Montreal at 792.